← Carlsbad Caverns — Wow! We all need real life reminders of the charm of stopping to smell the flowers and doing various other things which we might too easily skip or forget about. 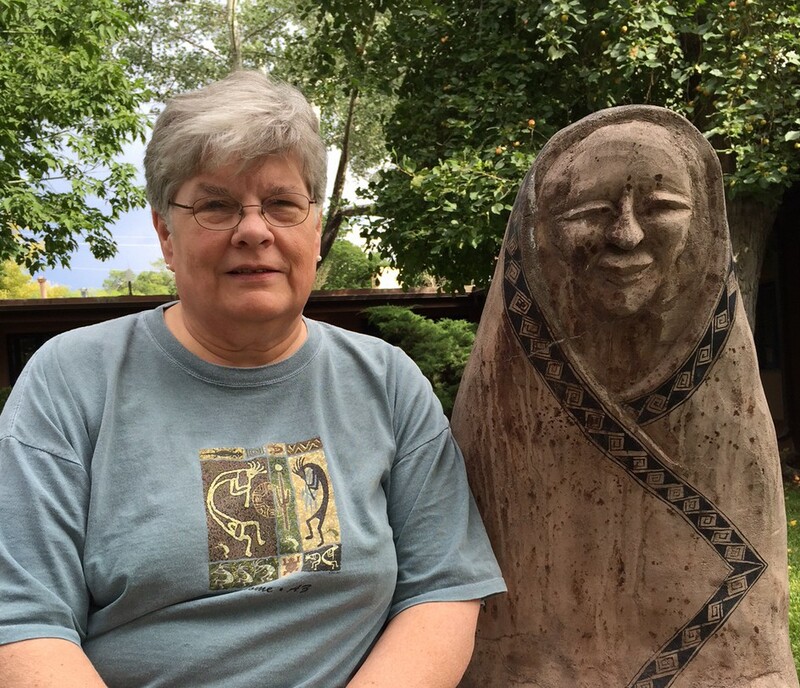 On our recent trip to New Mexico I got my real life update on a brief evening walk around the heart of Taos. The city, which is more than a bit like Santa Fe in its adobe colonial architecture and art scene, has a very compact center with dense traffic. And that promotes taking quiet walks along the arcades and side streets. I am not a power walker, so I ambled and looked – and discovered things I would not have enjoyed nearly as much if I had been in a car. 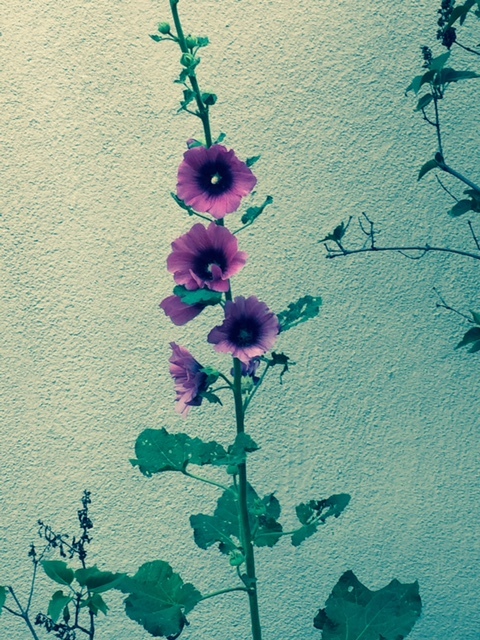 Did you grow up with hollyhocks (Alcea rosea)? Central Illinois supports these perennials very well, and so does New Mexico. According to the hardiness maps, Massachusetts should support them too, so why don’t I see them here? I have very fond memories of making hollyhock ladies from the full blossom turned to hang like a bell, with a tear shaped bud attached for a head. They remind me of the twirling Waltz of the Flowers in Fantasia. 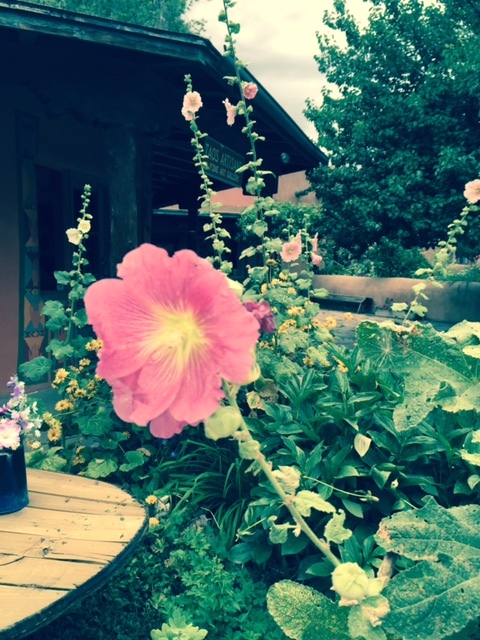 So I was totally charmed to see hollyhocks (even scrawny ones) blooming in the landscaping of the Taos shops. I really must try to raise some here at home! (Rudbeckia hirta – I grow those now but they don’t look as good). Lazily-dripping fountains in various corners added to the “slow down and take it easy” atmosphere. The art-filled city welcomed me with a wooden statue/bench, perfect for resting to contemplate the surrounding gardens. My new-found sister and I congratulated each other on having the wisdom to slow down to appreciate that day and place. And to think that I would have missed all this in a quick drive-by! May you have a lovely, slow-lane week ahead of you! This entry was posted in Travel, Uncategorized and tagged black-eyed Susans, columbines, fountains, hollyhocks, New Mexico, sculpture, slow lane, Taos, travel. Bookmark the permalink. I had really nice hollyhocks. 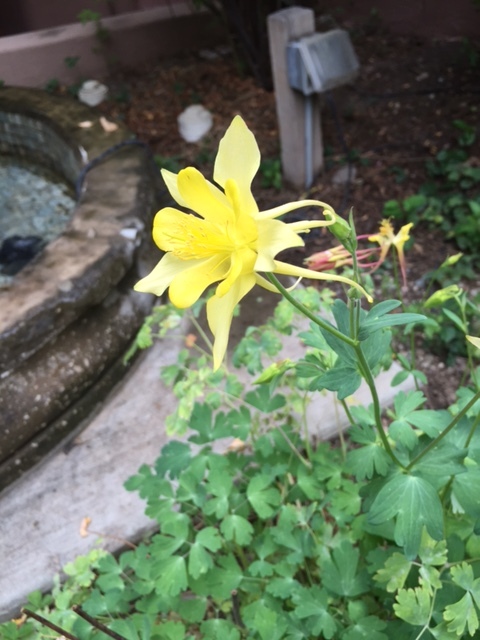 and columbines, in my last apartment in Somerville. When I was little I made hollyhock dolls, too. I’d put them in a barrel of water and they’d dance around. I don’t remember seeing hollyhocks in New England. Thanks for improving my knowledge. Yes, floating hollyhock ladies are the best! Thanks for writing.